Jewelry and watches are some of the top items that get stolen from a house, so keep your possessions locked away in this sturdy wooden watch box. It comes with a beautiful, silver lock that not only adds elegance to the overall feel of the design but functionally provides security so your kids can’t get their hands on your treasured timepieces. The lock is ideal for engraving the name of that special person in your life, the perfect gift idea. We all probably have that one jewelry box or drawer where we just throw our wardrobe accessories because it’s either easy or we just don’t have a place to put them. The problem is, being haphazard with our possessions can cause scratches, discoloration, or straight-up breaking. 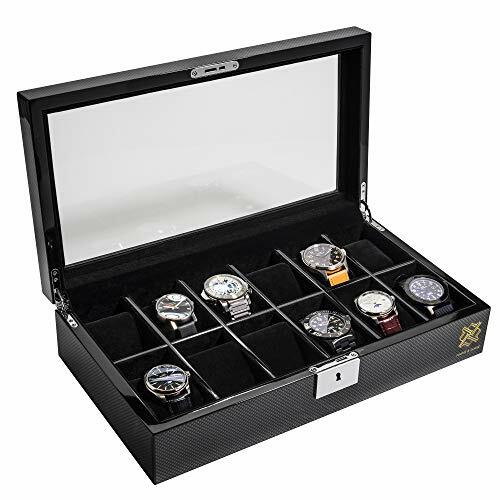 With our dresser watch organizer, you can entrust our product to organize your items in a beautiful encasing that is plush and will protect the integrity of your designer accessories. We at Hawk & Gable are so sure in the value of our product, we offer a complete satisfaction guarantee. If you aren’t totally happy with your purchase or there is some kind of manufacturer default, send it back for a new one or a total refund. Your happiness is our success.